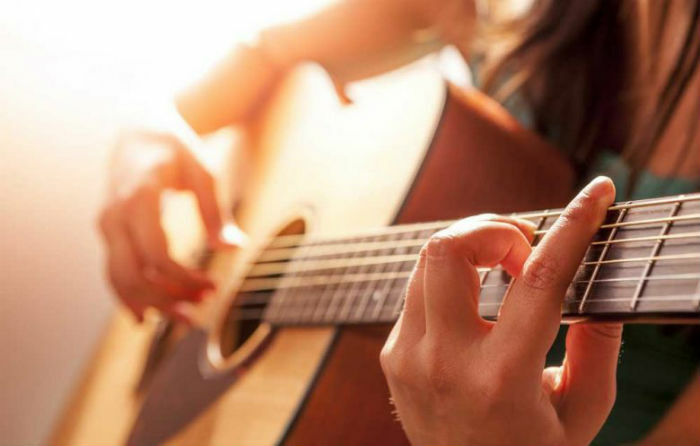 Playing the guitar is a stylish way to bring music in an individualistic way. Before you reach the next level, you always have to start as a beginner. 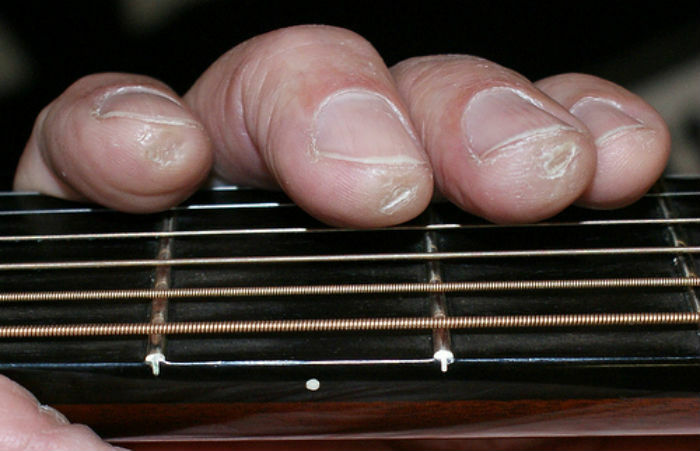 Learning basic guitar hurts fingers in the first few months is a common problem among newbies. It seems to be an inevitable ache that guitar players tend to suffer in their initial phase. We should learn about the cause before figuring out the solution. Understanding from the root will provide possible heal to the problem. This writing aims to explain the reason first; then, we’ll look further to how beginners can minimize the trauma. Why Basic Guitar Hurts Fingers at the First Few Chords? You were probably one of the most enthusiastic students of a guitar course, but as soon as the steel strings obstruct against the un-calloused fingers, it wore you down. It is understandable that the irritation comes from the pain could border you with the fancy skill. Though how hard you try to ignore it, it seems to be a stubborn ache that lasts for weeks before you get used to it. Look at your fingers now, the one on your righted handed. Do you see the tips covered by such a thin skin layer that you can detect the tiny tissues? Think about you are going to use those vulnerable tips to force into the steel strings and hardwood frets on the guitar. The imagination sounds painful; the fact could be worse. 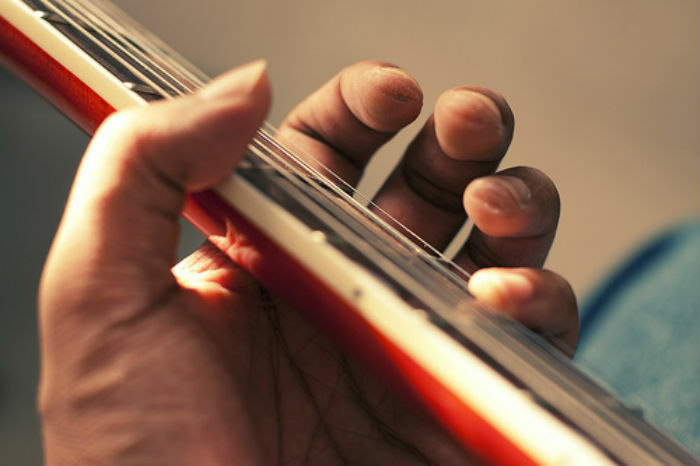 The guitar’s action is the primary contributor to finger pain. 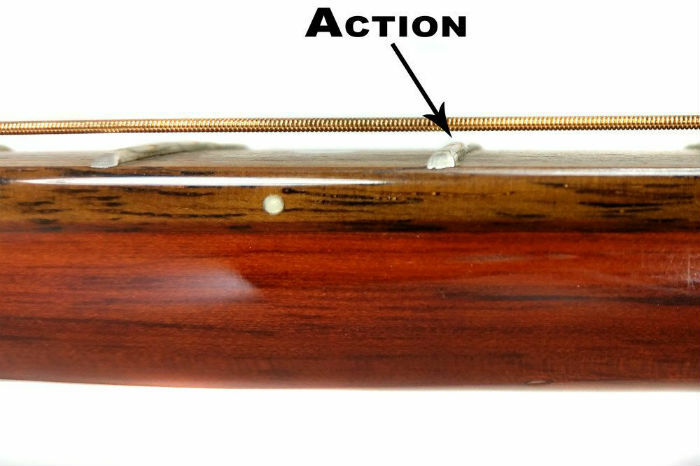 You can lower the action by adjusting either the neck height, bridge height, truss rod, neck saddle or bridge saddle. However, the lower the action, the more fret buzz you will get on the strings. It is also the slender metal strings of different gauges cause skinny impacts on your fingers almost similarly to cutting your fingers with a dull knife. Most beginners start with an acoustic steel string guitar for its narrower neck compared to a nylon string guitar. Untrained hands are likely to struggle from providing enough force to push the strings all the way down for a pure sound. The more strength you add, the more hurtful your fingers get. The Gauge of the Strings Also Matter. If you are lucky enough to have light gauge strings on your instrument, it causes less finger soreness. Medium or heavy gauge strings, on the other hand, hurts worse but will make you adapt to the gadget more quickly. The lack of calluses is a controllable factor. 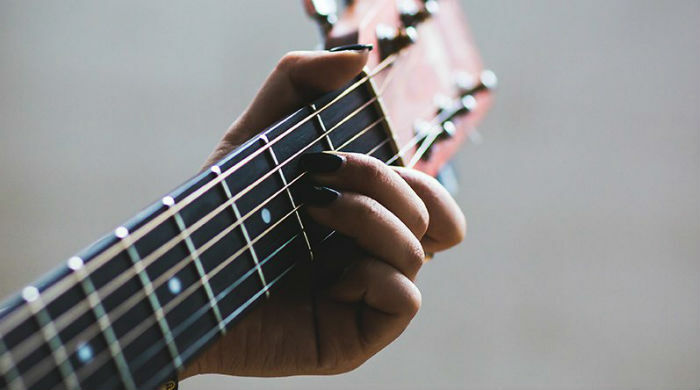 When you get to use the guitar in plenty of practices, calluses can form in a short time, giving you cushions on the tips. Playing guitar requires multiple movements from one chord to another. When your muscles exceed its capacity, they will get fatigued. That joint pain disables you to continue. It should be a minor factor, but we think it goes to the cause of finger soreness that needs help. You can see these questions spreading all over the internet, probably in your guitar class too. “Are my fingers too big for guitar?”, “why are my finger too little?”. Basic guitar chords are easy for most players. The point is to place your fingers in the right positions. Big-fingered people claim their tips are too fat for the fretting. 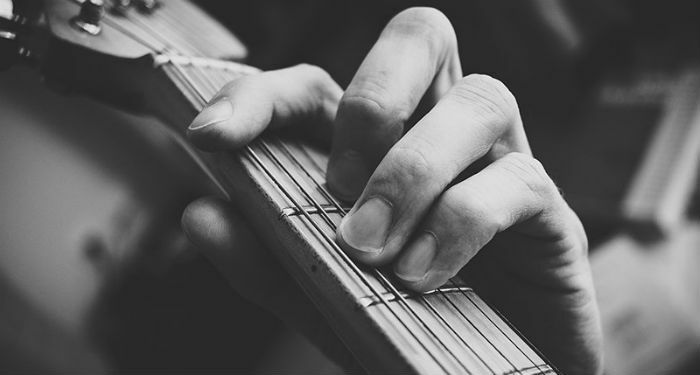 The distress happens when you press down on the tips of your fingers, they get squeezed between the other strings. Hence, they struggle in finding the right place to press down. Example with the D-chord. Practicing to get familiar with chords in small range needs time and effort. You need to get your fingers fit without touching the neighbor string. You can use your strumming hand to navigate your fingers to where it needs to go. Consistent trains can lead to soreness but will develop muscle memory in your hand for the next jam. The problem here is the finite distance between the finger causing limited stretch. Also, the reach between the tip of your thumb and your index finger demands small hands to maximize it. Stretching exceed the range would wear your muscle down. But it can be fixed with a thin neck guitar and the right posture of your wrist. Begin with the easy chords first will get your fretting fingers familiar with the stress. It would be better if you could afford extra light strings. How do You Stop Your Fingers from Hurting when Playing Guitar? That’s what people say. Many suggestions state that you should live with the agony. The pain isn’t something unbearable that harms your daily basics. But untraditionally, there are inventions available to get you through the pitching phase. The so-called homemade finger protectors are among the products. We will look through the ways to overcome this discomfort in old and new, natural and unnatural methods. You’ll be able to know how to help sore fingers from the guitar. There exists a fun fact of guitarists trying to dismiss the pain by all sorts of things. They coat the fingers with glue cap or roughen them up with an emery board. Those transitory solutions appear to be ineffective yet causing more pain. Though the ways could help you get through the pain that comes before the calluses. It should be better to leave your skin to get toughened up creating thick calluses. It is the callused areas of skin that are hard in response to repeated friction and pressure. Nails are not friendly to guitar strings. They interfere with the contact of your fingertips to the chords causing dud sound. A passionate guitarist finds ways to keep their nails neat but not a beginner. Once you get to play the strings, you will find no help from nails. You can grow them later, can’t you? Guitar strings vary from light to heavy gauge. If you can afford the light ones, you can reduce the suffering. Lighter gauge is thinner. It makes the guitar easier to play. It doesn’t require much effort to press down. Heavier gauge strings, on the other hand, are suitable for advanced players who tend to switch to bass or electric guitars. Since you are a beginner, you may tend to press the strings with all your power. It isn’t necessary. Pressing too hard will limit your speed and doesn’t allow you to generate nice sound. What’s worse is you can develop tendonitis results in interruption of your guitar career. Try to release your wrist and press hard enough to make the strings firmly in contact with the frets. 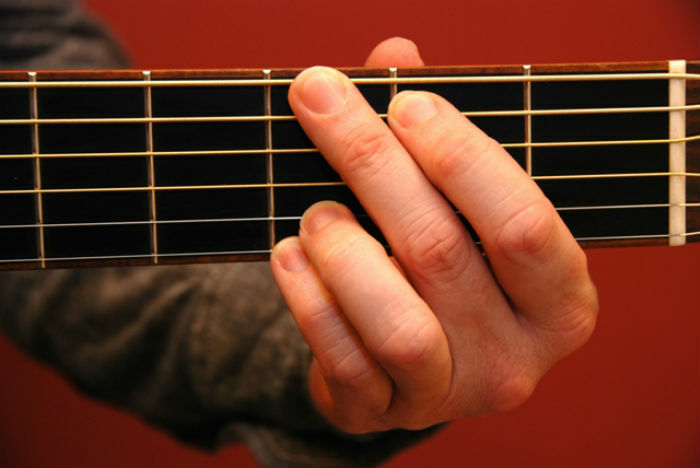 To practice this correctly, you can try the D-chord by placing your fingers on the right positions, then add an a-bit-above-average force down to the fret. Once you are done, play the strings with the other hand and see if the sound comes out in clean. It is when your hands are softened by water from shower or dishwashing. The tenderness allows the metal strings to cut through your skin more recklessly. Even rough calluses don’t stand the water. You don’t want to damage your callous fingers too early before you can step to the next level. The same applied for blisters on fingers. In this case, treat yourself to heal before you resume to the practice regime. You’d be surprised how tempting it gets to pick those cuticles off. Remember you’d get back to where you were. Believe, it will be a daunting task. Apple Cider vinegar is the recommended home remedy for sore fingers. Soaking your painful fingertips in the liquid in 30 seconds, before and after playing will help numb the ache. Icing your finger also helps alleviate soreness. Some anesthetic products like toothache creams work the same function. It is the rubbing kind, not for drinking, in this case. You can find isopropyl alcohol products in most pharmacy. The alcohol functions in drying out your fingertips. It further causes the calluses to form much faster. Besides, it repairs worn calluses, fingertips and restores proper sensation to your fingers. Using it by dipping your fingertips in for 30 – 40 seconds. Rumor claims that Eric Clapton applied this technique 3-4 times a day to keep his fingers in the best condition before going on the stage. Calluses form after a few weeks of regular playing that will end the soreness. Maintaining by frequent practice is critical. By this we mean don’t play too much. If you happen to indulge in the play, you are likely to get blisters or cuts. As mentioned above, you have to stop the section until you get your fingered recovered. Tincture of benzoin is recommended for protecting your skin. It should be your target in the first place. Your skill will grow with the calluses. Soon you will recognize you’re at a higher level with well-built callous fingers. It is the moment where you conquer the pain and are ready for advanced performance. Not fewer guitar players let the pain blocks their way to the reward. While the pain is tolerable, it is not worth to give up unless you feel the guitar is too hard for you. Being perverse and persistent will take you to the first success which proves your courage to be a real guitarist. How Can I Make My Fingers Stronger for Guitar? In addition to keeping your fingers from soreness, develop a bit of strength and independence in them would be a brilliant solution. Start with your first finger at the fifth fret of the thickest string. Reach out the last finger up to the eighth fret on the same string. This little “finger gym” workout helps you develop the stretch between the fingers thus makes them more agile. The holding down works on the muscles to make your finger stronger. Keep your fingers slightly rounded and ensure that you are pressing the strings with the end tips of your fingers. It helps to toughen up your skin and forms the calluses faster. This practice may trouble small fingers with limited reach range. While trying to keep the other fingers on the thickest string, you might not be able to reach it with the pinky fingertip. It will require more work than long-fingered people. It is essential to get your whole body relaxed while holding the guitar. Don’t try to burden your shoulders with too much muscle squeezing. Besides, release your wrist at the action as well as your finger joints. 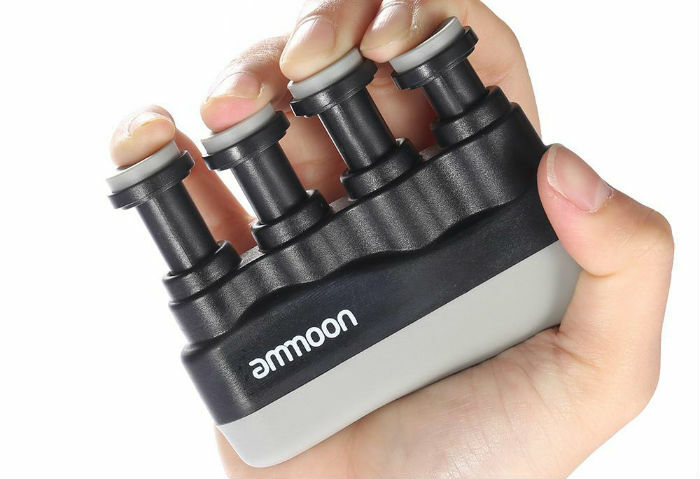 The devices mean to help you build and maintain fingers’ strength. But many users have proven its theoretical effectiveness is a waste of time and money. The machine may come in handy in case you have to go on a long drive or flight with no access to the guitar. You can use it for dexterity practices. They are available in different tension ranging from light to heavy to upgrade through time. The little finger is the weakest one on your hand, so it requests more effort to make it work articulately. Repeatedly hammer-on and pull-off lessons of all pinky combinations with tOe other fingers would help the flexibility. Practice on the minor pentatonic scale, its variations, and modifications. Unless you were a player but left the instrument for quite a time, you would get the pain on the way back. The pain of playing the guitar as a beginner could be harsh to some people. Not all of them could make it all the way through the roughness. Basic guitar hurts fingers, but we believe a passionate guitarist understands the pain will go away shortly. Practice makes perfect. This cliché fits the suffering perfectly. You wouldn’t get anything if you gave up. But with the prompt method, the pain will be the last thing you suffer to master such a beautiful instrument.